On that fateful day in 2002, the Coast of Death claimed what has become its most infamous victim. The MV Prestige was a creaky, single-hull oil tanker that never should have been near the Galician coast in the first place. The tanker left St. Petersburg, Russia, without proper inspections. Inspections in 1996 on the Prestige’s sister ships showed that they had the same vulnerable sections that would fail in five years. Those two ships were decommissioned and scrapped before 2002. The Prestige was not and its hull failed exactly were it was predicted it would. When that happened, the tanker was towed towards a Galician port but denied entry by Spanish authorities; it was also denied entry to Portuguese ports. Thus, it was towed back out to sea and left at the sea’s mercy. It broke in two and sank on 19 November. A estimated 18 million U.S. gallons of heavy fuel oil spilled into the Atlantic Ocean. The environmental consequences were devastating. 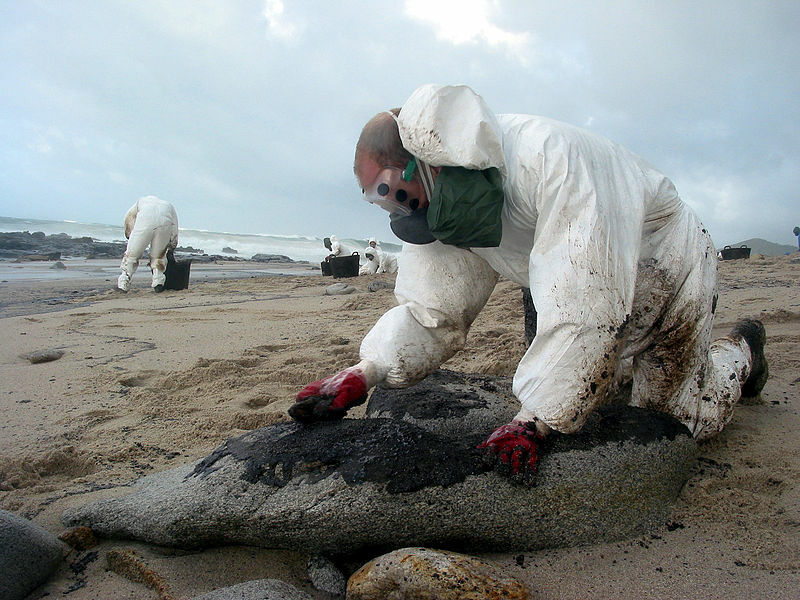 The oil spill reached beaches as far as France and Portugal, but the beaches of Galicia were obviously hit the hardest. The Spanish government dragged their feet in response to the growing environmental crisis. Once the first oil reached the coast near Muxía, it was obvious that Galicia was dealing with an ecological disaster. The rocky coastline and the pristine beaches were covered in thick sludge. Hundreds of thousands of fish, seabirds, and other marine life were killed. The Spanish government suspended offshore fishing for six months. Then came the volunteers. Scads of volunteers arrived from Spain and Europe to assist Galicia in the clean-up of its coast and beaches. Protest marches were held throughout Spain demanding that the Aznar government declare Galicia a disaster zone and provide badly needed emergency funds. 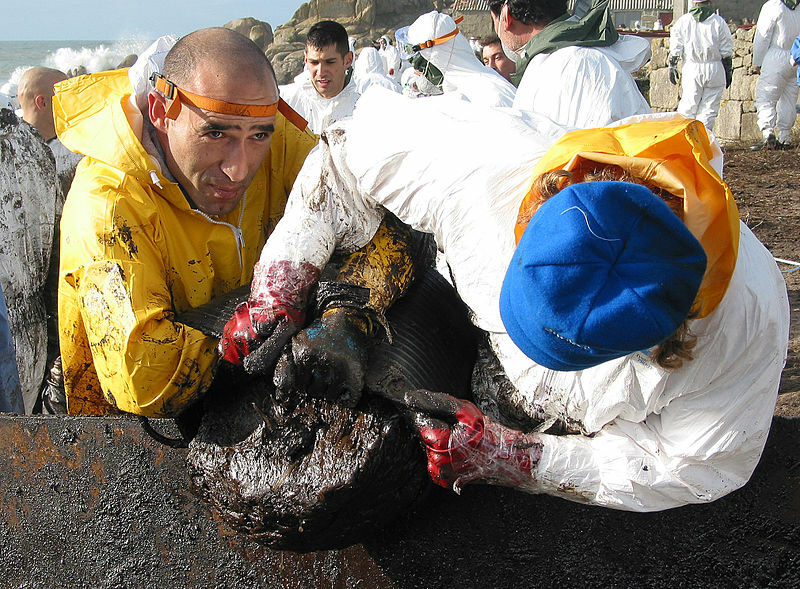 The oil spill had devastated the Galician environment and economy. But the response of the Galician people and the international volunteers met the challenge. One year after the disaster, Galicia had more Blue Flag beaches than ever before. The fishing industry eventually rebounded–Galician seafood is still renowned in Spain and Europe. Volunteer cleaning oil from a Galician beach. The legal and financial consequences of the Prestige oil spill were unfortunately and unsurprisingly sparse. A United States court ruled that the party responsible for inspections on the Prestige, the American Bureau of Shipping, could not be held liable because the ABS was a “person” and thus exempt from direct liability. In 2013, a Galician court could not establish criminal responsibility. Instead, the Prestige’s captain was given a suspended sentence for disobedience–he tried to disobey the French, Spanish, and Portuguese government orders to navigate the ship as far away as possible from the coast. The captain believed, later supported by environmental and scientific groups, that the spill would have been better protected if the ship had been brought in to a sheltered port. Three years later, in 2016, the Spanish Supreme Court ruled against the ship’s captain and gave him a prison sentence of two years for causing an environmental catastrophe. A London-based insurance company has been ordered to pay a $1 billion fine as of November 2017. Unfortunately, the Nunca Máis organization was reactivated in 2006 as Galicia has endured another ecological crisis: forest fires that devastated the Galician countryside. Forest fires continue to be a major problem every year in Galicia and bordering Portugal. Hopefully they will be able to find a solution to save and protect the Galician environment.